Provide your student with an enhanced course experience with the Exploring Creation with Chemistry, 3rd Edition, Video Instructional DVD. Sherri Seligson goes on location and provides over 20 hours of engaging instruction. Want to explain the substance of everything that you can see and even things that you can’t see in a manner that is easy to understand? Enhance your student’s chemistry course with this outstanding video instruction DVD featuring Apologia author and scientist Sherri Seligson. Using on-location video footage and animated diagrams, Sherri investigates the properties of matter and the many ways in which matter interacts, combines, and changes into new substances. Understanding the natural world around us has never been more fun. This video instruction DVD was created specifically for students using Apologia’s award winning curriculum Exploring Creation with Chemistry, 3rd edition. NOTE: To use this disc, you must have a DVD drive on your computer and a program capable of playing .MP4 files. You must also have a program capable of opening PDF and other image files. Not for use in DVD players. THIS ITEM IS NOT RETURNABLE ONCE OPENED! TO VIEW THE DVD TABLE OF CONTENTS, PLEASE CLICK THE DOWNLOAD BUTTON ABOVE. Apologia Advantage Set™ – Chemistry 3rd Ed. Save 10% off of full retail with this chemistry set for high school. The Exploring Creation with Chemistry Advantage Set includes the textbook, test and solutions manual, and student notebook. 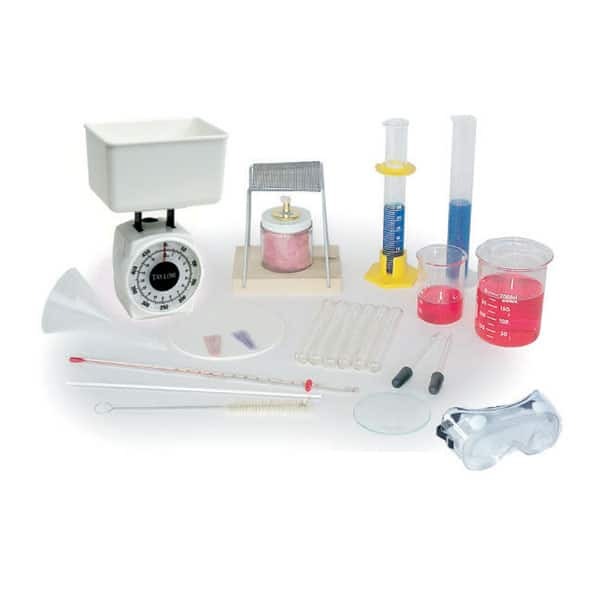 This basic lab kit includes all the tools you need to do the experiments in the book; just add the common household items listed on the lab supply list. All lab equipment ships to U.S. locations only.